DHCP authorization is the process of registering the DHCP Server service in the domain for Active Directory® directory service for the purpose of supporting DHCP clients. DHCP authorization is only for DHCP servers running Windows Server 2003 and Windows 2000 in an Active Directory domain. Why authorize a DHCP server? 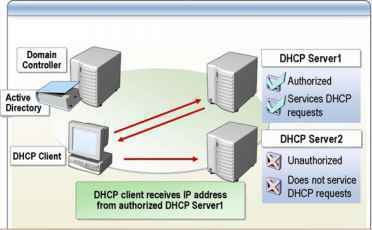 An authorized DHCP server is a DHCP server that has been authorized in Active Directory to support DHCP clients. Authorizing a DHCP server provides you with the ability to control the addition of DHCP servers to the domain. Authorization must occur before a DHCP server can issue leases to DHCP clients. Requiring authorization of the DHCP servers prevents unauthorized DHCP servers from offering potentially invalid IP addresses to clients. If you are configuring a DHCP server, authorization must occur as part of an Active Directory domain. If you do not authorize the DHCP server in the Active Directory domain, the DHCP service will fail to start properly, and then the DHCP server will not be able to support requests from DHCP clients. A DHCP server controls IP addressing configuration data that is sent to DHCP clients in a given network environment. If a DHCP server is improperly configured, then the clients that receive incorrect IP address configuration data from this DHCP server will also be also incorrect. Active Directory is required to authorize a DHCP server. With Active Directory, unauthorized DHCP servers will not be able to support DHCP clients. The DHCP Server service, on a server that is a member of Active Directory, checks with the Active Directory domain controller to verify that the DHCP server is registered in Active Directory. If the DHCP server is not registered, then the DHCP Server service does not start, and therefore the DHCP server cannot support DHCP clients. Example When the member server named DHCP Serveri starts, it checks with the domain controller to obtain a list of authorized DHCP servers in the domain. If DHCP Serveri finds its own IP address on the list, the service starts and can support DHCP clients. When the member server named DHCP Server2 checks the list, it does not find its own IP address on the list of authorized DHCP servers for the domain. Consequently, the DHCP Server service does not start and it cannot support DHCP clients. Stand-alone DHCP Under certain circumstances, a DHCP server running Windows 2000 or server Windows Server 2003 initializes even if it is not authorized. If a DHCP server running Windows Server 2003 or Windows 2000 is installed as a stand-alone server that is not a member of Active Directory, and if it is located on a subnet where DHCPINFORM will not be transmitted to other authorized DHCP servers, then the DHCP Server service will start and provide leases to the clients on the subnet. A stand-alone server running Windows 2000 or Windows Server 2003 will broadcast DHCPINFORM packets. If there is no response to the DHCPINFORM packet, then the DHCP Server service will initialize and begin servicing clients. If an authorized DHCP server hears the DHCPINFORM packet and responds with a DHCPACK, then the DHCP Server service will stop. The stand-alone DCHP server will continue functioning if it receives a DHCPACK from another DHCP server that is not a member of the Active Directory. How to activate dhcp under active directory 2003? 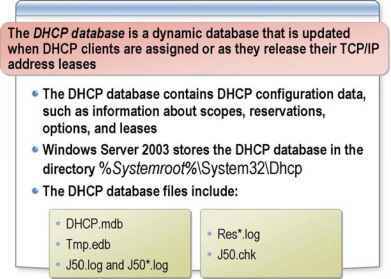 How to authorize dhcp server on windows server 2003? What happens if you skip ad authorization for DHCP server? Why is it a good idea to require a DHCP server to be authorized? Why it is important to authorize a Windows DHCP server?